Kickboxing can help with weight loss and offers many health benefits. You may not see as many women kickboxers as men, but this type of exercise offers a killer workout and gives you an easy outlet for stress. Kickboxing is fun to do, and it sculpts all the muscles in your body while burning calories at the same time. Incorporate it into your workout routine for a way to seriously blast fat and get in shape. Always talk to your doctor before starting a new exercise program. Kickboxing differs slightly from traditional boxing, because you incorporate kicking moves into the routine rather than simply doing arm moves. Get your stress out with jabs, hooks, high kicks and side kicks. At the same time, you'll be burning mega calories and creating a muscular shape you'll be proud to show off. Like any other type of exercise, you'll need to have the right equipment for kickboxing. If you work out at the gym, heavy bags are available, but if you prefer a home workout, look for one at a sporting goods store. Wear comfortable clothing that won't hinder your range of motion and is not so loose that it gets in your way. Wear shoes with plenty of traction and a pair of boxing gloves. Look for a pair designed for women because they'll be smaller and fit you better. Some gyms provide them and might even sell them. Keep a bottle of water handy so you stay hydrated throughout your workout. You'll know you're burning calories because kickboxing makes you sweat and elevates your heart rate. This is perfect for weight control and protection from health conditions related to being overweight and sedentary. During an average one-hour kickboxing class, a 135-pound woman will burn about 300 to 450 calories, according to the American Council on Exercise. Keep in mind that if you take lengthy breaks or slow down toward the end of your session, your calorie burn is likely to be lower. Smaller women burn fewer calories during a session than do larger women. Clearly, the benefits of kickboxing are huge. In addition to the calorie-burning effects, you'll activate most of the muscles in your body, helping tone and define them. This includes your arms, legs, core, back and shoulders. A consistent routine can also help improve your flexibility and increase energy levels. Many women choose kickboxing as a form of self-defense, which might improve your confidence and self-esteem as well as reducing stress levels. Kickboxing is fun for many women, which increases motivation. Eliza Martinez has written for print and online publications. She covers a variety of topics, including parenting, nutrition, mental health, gardening, food and crafts. Martinez holds a master's degree in psychology. Do Boxers Do Mostly Push-Ups for Their Upper Body? Does Jumping Rope Work Out Your Chest? What Are the Benefits of Kickboxing Classes? 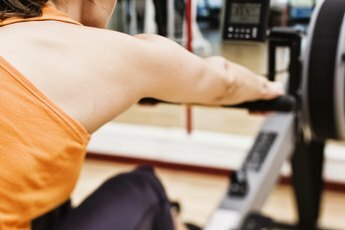 Are Spin Classes Good for Losing Weight?